River Wild Mt. Bachelor Village Resort, 3 bedrooms, 2.5 bathrooms, sleeps 8-9, 1 king, 1 queen, Bunks-1 twin over 1 full, and 1 twin, WiFi, Fireplace, Community Pool and Hot Tub, Close to Mt. Bachelor Ski Resort! Sorry, no pets! Rafters Court is located in the exclusive neighborhood of River Wild in Mt. Bachelor Village Resort and is fully furnished with modern, contemporary decor with a spacious 2,034 sq. 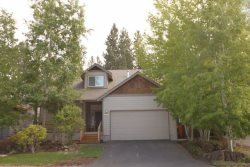 foot floor plan and makes an excellent vacation home in a prime location in Bend, Oregon. Located literally steps from the Deschutes River trail access for family time, photography, running, hiking and biking. The Rafters Court River Wild vacation rental has air conditioning and free WiFi. The king master suite is located on the lower level with a full on suite private bathroom, large flat screen LCD TV, DVD player and large walk in closet. The king master suite has its own private access to the large wrap around deck with a natural gas grill, outdoor dining and a porch swing. The queen guest suite is located on the upper level and includes a desk for the business professional working remotely and "jack and jill" access to the guest full bathroom. The guest bunk room is furnished and perfect for little ones with a twin over full bunks as well as a twin bed, with an extra twin mattress if needed and a desk to color or work on a project. The fully equipped kitchen has stainless steel appliances with a five burner gas range and oven, dishwasher and side by side refrigerator and freezer, as well as formal seated dining for 6 and additional seating for four at the breakfast bar. The open and social floor plan opens up to a large living room with large windows and plenty of sunlight and is located off of the tiled entry and furnished with a round sectional leather sofa and chairs with a fireplace, a 42" flat screen LCD TV with ROKU capabilities only. Spacious and bright with furnishings with contemporary, modern decor, this River Wild vacation rental is literally steps away from the Deschutes River trail access with amenities that include a community pool and hot tub, playground with swing sets and park! The exclusive neighborhood of River Wild is located in Mt. Bachelor Village Resort, pivotally located with easy and close access to Mt. Bachelor Ski Resort--just 18 minutes away. Great for winter and summer fun! It is also 5 minutes to downtown Bend, and the Old Mill District Shopping Center with many dining opportunities, shopping, movies, concerts and festivals year round. River Wild of Mt. Bachelor Village Resort is a pivotal location for all that Bend, Oregon has to offer: minutes to Mt. Bachelor Ski Resort, Deschutes River Trail, Old Mill District, Les Schwab Amphitheater, Drake Park, and Downtown Bend, Oregon with hundreds of connected trails for mountain biking, running and hiking with simple, easy access. Located right off of Century Drive which leads to Mt. Bachelor Ski Resort, Cascade Scenic Lake Highway, and trails for mountain biking for skill levels ranging from beginner to advanced riding and road biking ranging from easy to the hardiest riders for a great training work out sessions. Approximately 30 minutes from internationally known Smith Rock for incredible rock climbing, bouldering and hiking. Located directly off of the Cascade Scenic Highway (Century Drive), the road which boasts of 40 lakes for a leisure drive, outstanding photo opportunities and scenic vista points! This quintessential vacation rental home is ideal for lodging one or two families traveling together and romantic get-aways in a very peaceful setting. Ideal for a vacation of winter or summer fun! Access to 20 miles of river trail along the Deschutes River and amenities that include a community pool that is open from Memorial through Labor Day weekends and a community hot tub which is open year round until 10 p.m., as well as a playground and park! It is one of the closest resorts to Mt. Bachelor Ski Resort--just 18 minutes away. Just 5 minutes to downtown Bend, with many dining opportunities, shopping, movies, concerts and festivals year round. Easy access to the Old Mill District and Shopping Center, Les Schwab Amphitheater and Drake Park. Year-round seasonal outdoor recreation opportunities in Central Oregon for skiing, snowboarding, snowshoeing, cross country skiing, fly fishing, hiking, rock climbing, white water rafting, kayaking, lake kayaking, road, mountain biking and paddleboarding . Located right off of Century Drive which leads to Mt. Bachelor Ski Resort, several lakes and trails for mountain biking for skill levels ranging from beginner to advanced riding. New this season, Mt. Bachelor is partnering with Safeway (320 SW Century Drive) to provide a shuttle ticket sales location in Bend. Less than 1/2 mile from the Shuttle Park & Ride lot, you can purchase 1-ride, 2-ride or 10-ride punch cards at Safeway before you get on the bus. Community hot tub open year round, daily until 10 p.m.